There is one part of the art world that I have always tried to avoid thinking about : trends. I really have no bearing as to what is in or out of fashion, and care less for the people responsible for creating and reporting these trends. The experience of art is so highly subjective, that trying to affix a collective mentality to its value is to denigrate that work, and ultimately be dismissive of the individual that created it. Every work ever created is autobiographical in some way - whether it is Rembrandt painting an intense self portrait, or a concept artist floating Zeppelins in Venice. Whether working alone or in a group, ideas emanate from individual people, and are executed by individual people. Even in the broadest possible sense, the work produced during a given period is a barometer of that artist's experiences. It is a matter for sociologists and mental health professionals to try unravel why people express themselves in a certain way - all that I would like to suggest is that before judging anything as good or bad, to merely understand its context - as this in turn leads to a greater ability to understand the human creative urge. Claudius Summoned. 1867. Fred and Sherry Ross Collection, US. A few years ago I purchased a copy Suetonius The Twelve Caesars - on the cover was a painting showing a scene from antiquity, a young man kneeling, it seemed begging to a Roman soldier. There are of course caveats with Suetonius, but discovering these discrepancies is part of the fun. Nonetheless, works such as the Twelve Caesars, and HBO's Rome are often that igniting spark - inspiring a new phase of learning - they definitely were in my case. I don't seem to be alone in this - a Google Trends search for Suetonius, demonstrates a massive surge on searches starting in late 2005 - exactly concurring with the premiere of the HBO series! 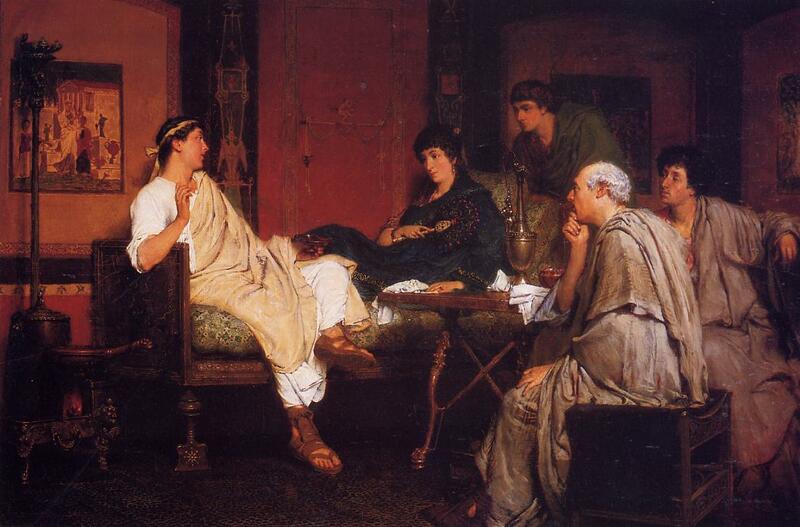 I soon discovered the scene depicted in this painting was the accession of the Emperor Claudius. What an odd tale it was - and what an odd sight. We have this image of Roman Emperors as decadent, powerful beings, in some cases revered as divinity. Yet here was Claudius, on his knees. Intrigued to learn more, I read more about him in non-fiction volumes, and eventually saw the amazing BBC series I, Claudius. When the assassins of Gaius(Caligula) shut out the crowd under the pretence that the emperor wished to be alone, Claudius was ousted with the rest and withdrew to an apartment called the Hermaeum; and a little later, in great terror at the news of the murder, he stole away to a balcony hard by and hid among the curtains which hung before the door. As he cowered there, a common soldier, who was prowling about at random, saw his feet, and intending to ask him who he was, pulled him out and recognized him; and when Claudius fell at his feet in terror, he hailed him as emperor. I eventually felt I had a better measure of the tale of this curious emperor, who is significant for the Roman colonisation of the British Isles. He seemed to survive the many deaths of other viable candidates on account of his apparent simpleness and a prominent speech impediment. Yet he proved to be a notewothy ruler, and was even granted the honour of being deified along with his forebears Augustus and Julius Caesar. Fast forward some 1830 years now. Dutch painter, Lawrence Alma-Tadema (1836-1912) was one of those rare artists who enjoyed great celebrity during their own lifetime. Famous for his obsession with antiquity, scenes from Ancient Greece, Rome and Egypt proliferate in his catalogue. In the film industry his paintings are used as cues for set and costume designers - from early silent pictures to The Ten Commandments, Cleopatra, and even recent titles such as Gladiator and The Lion, The Witch and The Wardrobe. At one level, Alma-Tadema must have enjoyed his comfortable lifestyle - we are told he built a Roman style villa, though privately would complain of the unending demand to paint "more Agrippas." From a historical perspective, I imagine there are some who dislike the Neo-Classsical artists that helped give us the Hollywood version of Rome, but in Alma-Tadema's work there is often something dramatic, beautiful and charming. Among my many favourites of his extended catalogue are the series of three paintings showing the accession of Emperor Claudius. Tadema must have had a fascination with this topic - it is a shame he did not live to read Robert Graves famous books or see their superb TV adaptation - I imagine he would have been delighted by them. 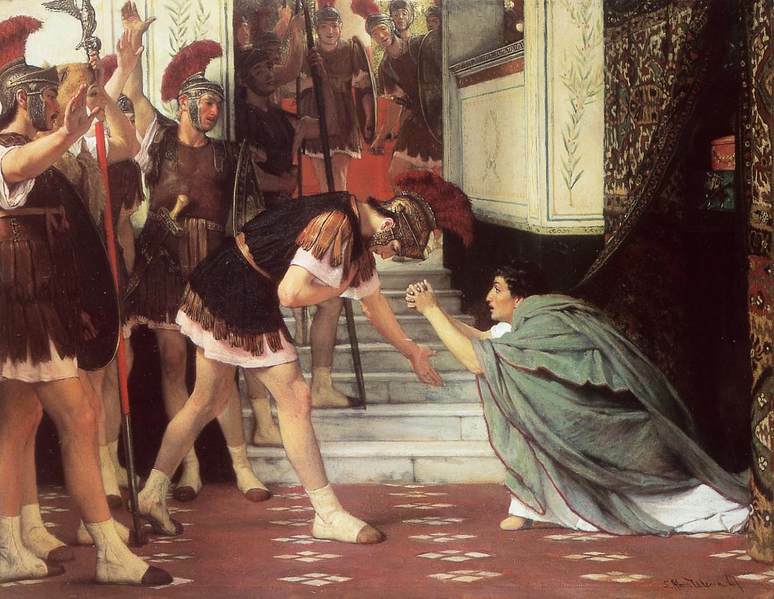 One of my favourite paintings of all time is A Roman Emperor, AD 41, completed in 1871. It shows the pivotal moment where Claudius is discovered behind the curtain, as described by Suetonius. There are many delights to be found on closer examination: the assassinated Caligula is only visible by the green shoes, with gruesome smears of blood adorning the bust of Augustus. The floor mosaic of a snake and the inscription genivs hivs l(ocvs) is another lovely touch. This painting is so richly coloured, so technically dazzling that the great apathy expressed by the likes of John Ruskin and the Bloomsbury crowd towards Alma-Tadema shows them as remarkably judgemental for enlightened minds. Dramatic and stylish, this piece is a potent a reminder of terrible consequences of corruption and greed, regardless of its setting in an era long past. One thing must be said about Tadema's inspiration. Just as he has inspired other creative artists and helped bring antiquity to life in film, his inspiration was also visual. We know that in 1863 he travelled to Italy on his honeymoon. He was particularly stunned by Pompeii - after this point a series of paintings vividly depicting villa internals were created. A lot has also been written about his viewing of the Elgin Marbles in an 1862 exhibition in London. My favourite of these 'domestic' pieces is Tibullus at Delia's, it really makes you feel like you are sitting in listening to the famed Roman poet. 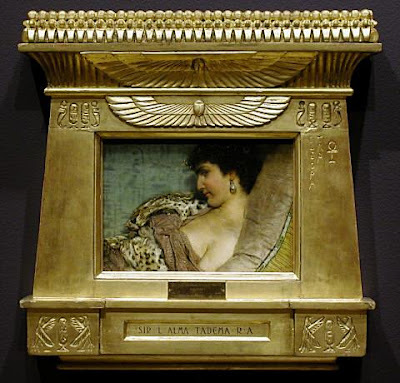 Another pioneering aspect of Alma-Tadema's work was the use of Tabernacle frames. Traditionally used in religious works, these frames were meant to signify the architecture of a church. Nineteenth century artists such as Lord Frederic Leighton and Alma-Tadema used these frames with non-religious paintings, which caused quite a stir. Alma-Tadema even went a step further, customising these frames to match the theme of the work - as in this portrait of Cleopatra(1877). For more on Tabernacle frames, read this great post at Bearded Roman. The National Gallery of Art in Washington also has a great audio podcast exploring the history of traditional Tabernacle frames. It is a quick listen, but highly interesting. To subscribe to more wonderful audio and video podcasts from NGA, visit their podcast site. 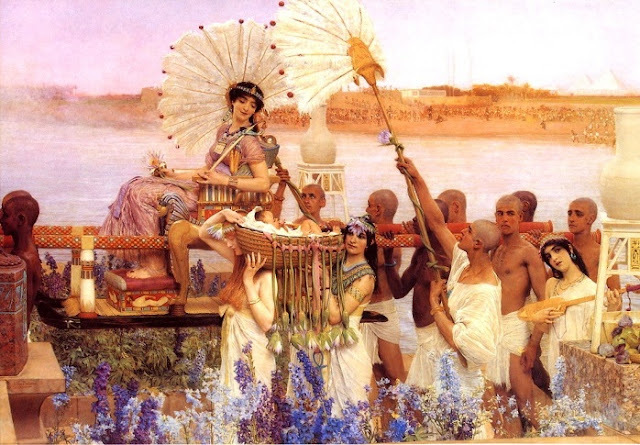 What are we to make of Alma-Tadema's commercial resurgence? I personally am not fussed. I have always admired his imagination and have a great respect for the power of his images to inspire other creative artists. Suetonius' words and Tadema's vision echo strongly in this scene from BBC's I, Claudius. Edit It seems Alma-Tadema is enjoying something of a revivial among collectors as a tabernacle framed version of The Meeting of Antony and Cleopatra was sold to a private collector on Friday May 6th 2011, by Sotheby's in New York. The original estimate was stated between $3-5 million USD - with the final sale price being $29,292,500 USD. It is heartening to note that previous owners have readily donated this well known piece to public exhibitions, and hopefully the new owner will do the same. The Sotheby's listing for provenance and relevant references is interesting to behold - particularly the dates of the references listed. Perhaps Alma-Tadema does not represent anything new and exciting to the world of art history academia, yet his ability to inspire film makers and concept artists working in digital and traditional media is profound. This is an interesting juxtaposition of the forces that motivate art historical study compared to creative artists. 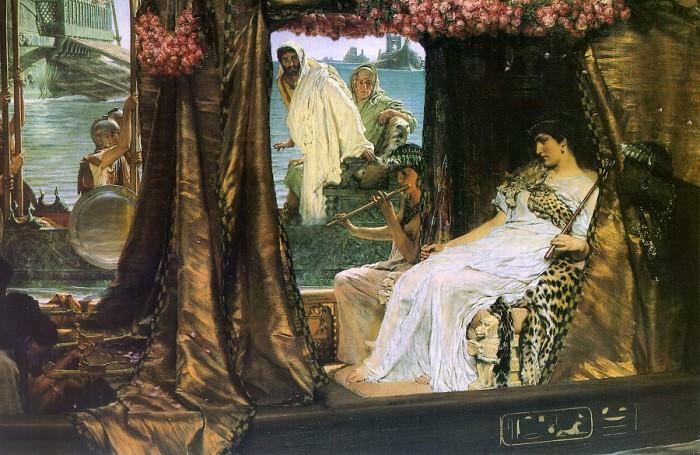 I have always liked Alma-Tadema, though I knew virtually nothing about him. I was surprised to learn he was Dutch and that he produced such a large body of work. However, even though I knew many of the images where "white-washed," he did--for me--capture the sense of other-worldness/excitement that antiquity always created for me. Great post--I hadn't seen some of these! In the film industry Alma-Tadema's paintings are used as cues for set and costume designers - from early silent pictures to .. more recent titles". But Alma-Tadema had no more access to information about, or relics from Roman villas than we have! He was a simply a clever artist who used colour and line sublimely. Do I think any painting is worth USA$36 million? No, of course not. But I would give my eye teeth to own one of Alma-Tadema's works. Hi Vicky! I remember the Alma-Tadema in your Cleopatra book! He was also known for displaying his works in wonderful Tabernacle frames - there's a charming portrait of Cleopatra he did with just such a frame. These themed frames were actually something that he and contemporaries like Leighton were famous for re-purposing. @Hels - Thanks for your comment! I think Alma-Tadema wasn't entirely paging his imagination when conjuring these images, particularly the villa internals. We know that in 1863 he visited Italy on his honeymoon, and was particularly stunned by Pompeii. I'll edit the post to put that in! Wow, Hasan, I'd never seen the Tabernacle frames, or that painting of Cleopatra. Thanks for including it! Glad you enjoyed it Vicky! I thought you would like that! We have a version of the same painting here in Oz, at but it doesn't have the fancy frame. Alma-Tadema and I, Claudius in one post. The internet doesn't get any better than this. I'm glad to find other Alma-Tadema fans. I have always liked him, much to my wife's hilarity - she thinks his work is adolescent and silly. I think I'm right in saying that he never painted a scene from antiquity until his visit to the Elgin Marbles at the Britsih Museum in 1862. although a Frisian Dutch by birth, he became a British citizen and lived in England for over forty years. I think his paintings of Empire are as much about the Britain of Victoria than Rome. Cheers for the comments RWMG and PM Doolan! The 1862 visit to the newly acquired Elgin Marbles does coincide nicely with his departure from his Master' studio and the decision to move away from Merovingian subjects to ones with a wider buyers appeal - namely Greece, Egypt and Rome. It likely influenced his decision to visit Italy in 1863! I love that such a visual experience triggered a new direction and success for him - just as his work has done for many others. Never heard of this artist, but I love his style! Victorian/Romantic w/out a hint of Impressionism. Welcome to 3PP Jim! I'm pleased to have introduced you to Alma-Tadema. You probably have seen his work before, they are often in books to do with antiquity. I hear what you are saying about Impressionism - particularly the French Impressionists - some of the more famous examples of which we have been so saturated with by the media it's hard not to develop an aversion to them. Some of the British Impressionists are worth looking at, definitely a bit more dark and thought provoking than pictures of churches and ponds! Walter Sickert is my favourite.. some imaginative types even think he was Jack the Ripper - though I think it was more likely that he simply had a fascination with the Ripper case, as many of us 'Ripperologists' do. Great post and comments! I liked how people brought up the Elgin Marbles. In fact, I recently taught a class which revolved around this case study on how the Elgin marbles affected the Western canon, largely because so many artists went to study the sculptures at the British Museum. I wonder how the Western canon (as we revere it today) would have been affected if the Parthenon marbles stayed in situ. It is interesting that Alma-Tadema is Dutch, isn't it? I can't help but add, though, that although he has Dutch parentage, he is best known as a British artist (he moved to London while in his early thirties). On a side note, before I became a college professor, I worked in an art museum. The museum director was a specialist in Alma-Tadema, and also works for Sotheby's as a consultant. He actually was present in the auction when Finding Moses sold at such an astounding price. What an exciting day for him (and for Victorian art in general)! I love this piece, and I envy whoever ended up with it. Cheers for the comments and sharing that reference M! I am not sure I envy the person who had to part with $36million. The relationship between art and its corporate value is one is quite distressing. Humanities programs are struggling yet people/institutions gladly fork out exorbitant sums... it is a shocking incongruence which strikes at the core of art as a enrichment of the soul and mind. I'm glad we as bloggers can converse about the beautiful and interesting things, without being too interested in the ugly economic side of the art world.